Welcome to the Soupir Lab webpage! I am an Associate Professor in the Agricultural and Biosystems Engineering Department at Iowa State University. I graduated with a B.S. in Biological and Agricultural Engineering from Kansas State University and M.S. and Ph.D. degrees in Biological Systems Engineering from Virginia Tech. I also worked as an Environmental Engineering Consultant at CDM Smith in Kansas City, Missouri between my undergraduate and graduate degrees. My research program is focused on soil and water quality, nonpoint source pollution control, watershed management, and water quality monitoring. We use both lab and field scale studies to examine the occurrence, fate and transport of pathogens, pathogen indicators and contaminants of emerging environmental concern (CoEECs) such as antibiotics and antibiotic-resistant bacteria to surface and groundwater systems. Findings from our work has implications to improve the Total Maximum Daily Load (TMDL) development and implementation process, identify the impact of landuse practices on water quality, and develop management practices to reduce pollutant transport. Our research group is a team of enthusiastic individuals working towards a common goal of improving water quality in Iowa and the world! We enjoy working with self-motivated students with a B.S. 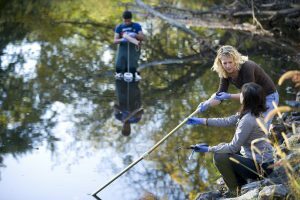 degree from a variety of disciplines including agricultural engineering, biological systems engineering, civil engineering, environmental science, agronomy, ecology, microbiology, and chemistry. Master of Science and Doctor of Philosophy degrees in Agricultural & Biosystems Engineering are available to students with an engineering background.Students with non-engineering backgrounds can apply to the interdisciplinary Environmental Science Graduate Program or receive provisional admission in ABE’s graduate program. Our students also have the opportunity to major in ISU’s one-of-a-kind Graduate Program in Sustainable Agriculture.Full assistantships are often available for qualified M.S. and Ph.D. students interested in joining our research team. Information about the admission process is available on the ABE department webpage. When applying to the ABE or Environmental Science graduate program, please send your resume and a short paragraph about your research interests to Dr. Michelle Soupir.